Health policy analysts have long been puzzled that millions of uninsured people snub the government’s offer of free health benefits. The Kaiser Family Foundation estimates that seven million of the 27.5 million nonelderly people who were uninsured in 2016 were eligible for Medicaid. That’s more than one-fourth of the uninsured population. Another eight million were eligible for Obamacare premium subsidies, meaning that more than half the nonelderly uninsured didn’t avail themselves of government-subsidized health coverage. Academic research suggests one possible reason: Medicaid recipients aren’t the primary beneficiaries of the program’s spending. The Senate gave final approval Monday to a replacement plan for the voter-approved full Medicaid expansion after more than an hour of debate — and a last-minute update to the price tag. The 22-7 vote — with all six Democrats and Sen. Todd Weiler, R-Woods Cross, opposed — didn’t change from the initial vote on SB96 last week, on the third day of the 2019 Legislature. Medicaid and Work: Crisis in Arkansas? The shrill criticism of the Arkansas’s Medicaid work requirements is not supported by facts. Health policy analysts have long been puzzled that millions of uninsured people snub the government’s offer of free health benefits. The reason so many Medicaid recipients failed to comply with the Arkansas work requirement may be as simple as this: They didn’t consider the benefits worth the effort. Yet, a study by the Buckeye Institute found that people who favorably respond to work requirements will earn far more—in some cases nearly $1 million more—over the course of a lifetime than those who remain on Medicaid and don’t increase their work efforts. The federal government now finances 90% of the cost of Medicaid expansion, but that doesn’t make it free. A recent report found that Medicaid represents about 29.7% of total state spending in fiscal year 2018. In 2008 it was 20.5%. These numbers will continue to grow, sucking up more of our limited funds. Thanks to a lack of fiscal discipline from both parties—and the unwillingness of the American people to confront our perilous finances—we are currently running trillion-dollar deficits and the national debt stands at around $22 trillion. We can’t pay for the government we have; expansion will just add to the burden of future generations. The Trump administration approved Arizona’s request to attach work requirements to Medicaid coverage, making it the eighth state to condition benefits on seeking a job, going to school or otherwise engaging in the community. Enrolled members of federally recognized Indian tribes — who noted their sovereignty — will be exempt from the rules, which will take effect in January 2020, the Centers for Medicare and Medicaid Services said. For several months, the Trump administration has been engaged in an internal debate over the merits of allowing states to partially expand Medicaid under the terms of the Affordable Care Act (ACA). Now, after losing the House to Democratic control (and thus also losing any opportunity to repeal and replace the ACA until at least 2021), the administration is said to be ready to make a decision in favor of allowing partial Medicaid expansion to proceed under state waiver requests. Federal law might be hard to change in Washington, but in some cases, states are able to take advantage of flexibility built into federal law to develop new programs and approaches. This is true under federal Medicaid law and it is also true under the ACA, which is why CMS recently stepped up efforts to support state-specific strategies to improve their individual health insurance markets and to develop alternatives to Obamacare that better meet the needs of their residents. More than 12 million nondisabled, working-age Americans are enrolled in Medicaid. They receive medical care that is virtually free, and in most states they are under no obligation to work or seek work. Sounds like a great deal. Until you consider how much these “free” benefits may cost a recipient over the course of a lifetime. That could total more than $323,000 in foregone wages for men and over $212,000 for women, according to a study by the Buckeye Institute, an Ohio-based free-market think tank. 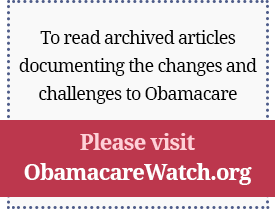 terminate the ACA exchanges while building new mechanisms for establishing enrollment in health coverage. As several states consider expanding Medicaid eligibility to able-bodied individuals above the poverty level, Virginia state officials have announced huge, unexpected Medicaid costs are threatening to siphon funding from programs such as education. Although Virginia lawmakers insist the new cost burden is not related to Medicaid expansion, they acknowledge the program’s share of the budget has been growing for years and has led to $460 million in unforeseen Medicaid costs.